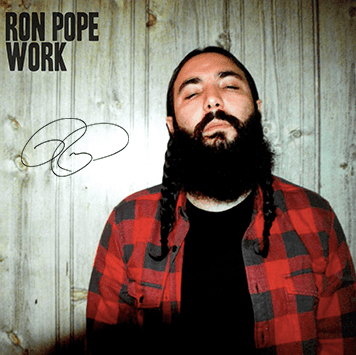 “I had a teacher, she told my mother that she better find me a trade/because boys like me well, we all grow up to be long term guests of the state,” Ron Pope reveals to us in the title track from his upcoming album Work. From that inauspicious childhood memory, Pope was inspired to take up songwriting and has established himself as a soulful force in the Americana scene, even creating his own record label, Brooklyn Basement Records. The album’s title track, while touching on the dire predictions of his teacher, is a testament to Pope’s refusal to be trapped by the expectations of others. “Sometimes at night I wake with a shiver/sweat soaking clean through my sheets/but then I remember I am who I am, not who they said I would be,” Pope sings with his trademark velvety voice, tinged with sadness but brimming with relief. While Work is inspired from an emotional turning point in Pope’s life, he refuses to allow the album to be a dreary soul-searching endeavor. Instead, it’s an unabashed celebration of his life, which is full of sentimental memories, yearning, troubles avoided, and a few confessions. On “The Last,” Pope reflects upon a fleeting romance and only remembers the best. Knowing that his lover will one day leave him, but refusing to be heartbroken, Pope embraces the beauty of his partner and the thrill of passion, all glorified over a toe-tapping beat and jaunty banjo. On “Can’t Stay Here,” the romantic tables are turned when Pope pushes an ex-love out of his life. With driving guitar and resolve in the voices of Pope and guest artist Katie Schecter, it’s more a statement of freedom than a mournful breakup song. Reflecting on where Pope is in life, “Dancing Days” recognizes that he has aged a few years, but he’s not going to let that slow him down (even if he might regret some of his decisions the next morning). Drawing instant comparisons to Beggars Banquet-era Rolling Stones, “Dancing Days” features a bluesy rock growl in Pope’s voice, and lively acoustic guitar, jangling keys, and jazzy horn. In album opener “Bad For Your Health,” Pope channels his dangerous side as he rails against fake cowboys, loves wildly, and lives on the edge. You can’t help but wonder if the song’s anti-hero is Pope’s alter-ego—maybe the person he might have been if he hadn’t focused on songwriting. Downright infectious with its Bruce Springsteen vibe, “Bad For Your Health” is a bold departure from Pope’s more stoic pieces—full of horns, southern rock swing, and powerful vocal grit. Work is a lyrical celebration of Pope’s life—where he started, the missteps he avoided, the whims and beauty of love, with some hell-raising thrown in for good measure. Having rolled up the sleeves on his blue-collared shirt at a young age, Pope has deliciously defied those early expectations and built the creative life he envisioned for himself.